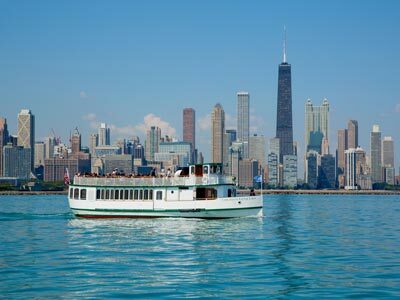 A fun, relaxing, informative boat tour along Chicago's beautiful waterways is the ultimate way to experience the city and leave a lasting impression on your group. With competitive group rates, frequent departures, daytime and evening boat tours, entertaining guides, exceptional service and a convenient downtown location with easy bus drop-off, Mercury Cruises is your best choice for Chicago River and Lake Michigan boat tours. Give us a call—we'll actually pick up the phone! Let our entertaining and informative tour guides bring Chicago to life with fascinating stories and fun facts of the city's rich history. You’ll cruise amongst soaring skyscrapers on the River and enjoy gorgeous skyline views from the unique perspective of the lake. Call 312-332-1368 or email grouptours@mercurycruises.com for group rates*. *Special school field trip rates available Monday - Friday. General group rates valid Sunday - Friday. No group rates on Saturdays. Group reservations accepted every day. Get a special perspective on our city as you enjoy a Chicago River and Lakefront sunset boat tour as day turns to night, watching our skyline transform into millions of twinkling lights. You’ll receive a free light wand and enjoy live commentary about the city's rich history. Call or email for group rates*. Call 312-332-1368 or email grouptours@mercurycruises.com for group rates*. *Group rates valid Sunday - Friday only. No group rates on Saturdays. Group reservations accepted every day. Science Is Fun Cruise - Designed for School/Youth Groups! Tour available for educational groups of 30 or more only. Professor Mercury guides students through a series of fun, hands-on experiments and interactive lectures enhancing their knowledge of the Chicago River and Lake Michigan’s biology, physics, engineering and ecology on this educational Chicago field trip. Learn more and see group rates.